Signed verso in pencil: "foto moholy=nagy". Secondary Inscription: Inscribed verso print in pencil in unknown hand: "60". 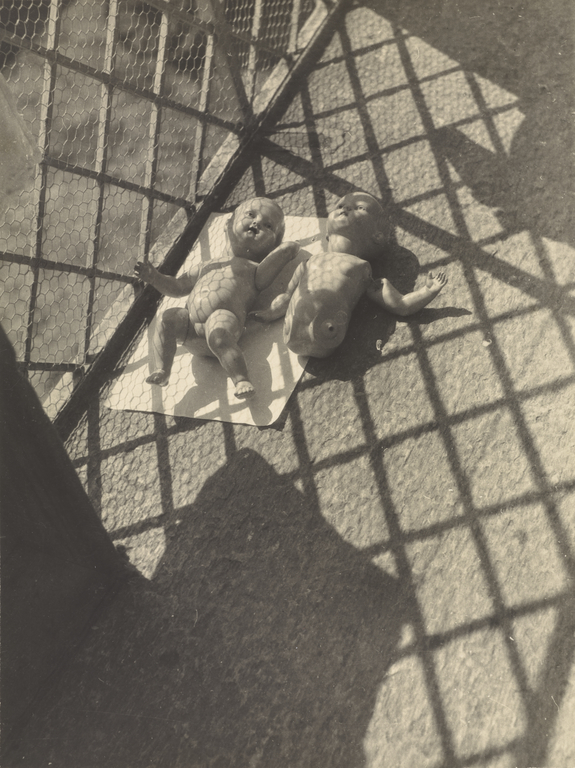 This photograph is a somewhat menacing, surreal image of two naked dolls, one of them missing its legs. They lie helpless upon their backs on a piece of paper, with the shadows of chicken-wire fencing dissecting their vulnerable bodies. Despite their predicament, László Moholy-Nagy used them strategically as a design element that interrupts the bold graphic forms of intersecting lines. The dominant diamond pattern of the railing casts deep diagonal shadows across the balcony, flattening out the composition, while the photographer's tilted view of the balcony defies traditional perspective, removing the space from associations with the real world.